Its difficult to say specifically exactly how long this project will take because you cant know up front how your old or outdated unit was originally configured. Also, as I discovered, you cant predict how many return trips to Home Depot will be required. Despite that, should you hire a pro? Not necessarily, most homeowners can summon their inner handyman to handle this repair job. But if you would rather not, find local unbiased reviews on the best plumbers on Angies List . Plumbing codes and standards have gone through many changes over the years, and most people know that the current trend is to use Energy Star appliances. One reason is reduced operating costs. Also, the federal energy tax credit is an attractive incentive. The installation details will vary somewhat by appliance manufacturer and model number, but this article goes through the generic steps. Specifically, this procedure is based on a Whirlpool Quiet Partner III unit that I installed. One bit of advice though — I would not recommend buying any Maytag appliance. The company has been bought out and the standards are almost non-existent. I bought one of their refrigerators and it went through two ice dispensers and two compressors in one year. And the repair work is farmed out and they dont stock parts locally. The actual repair work has to wait until the parts are shipped from the warehouse in Chicago. That turned into one week wait for the diagnosis appointment, another week for parts delivery, and another week for the repair appointment. Isolate power to your old dishwasher. Do this by tripping your circuit breaker or in an older home, removing the fuse. Next, remove your bottom front access panel. On many models, its held on with a pair of screws. With others it might be secured with friction clips. Find the wiring connection. You will usually find it hidden behind an electrical cover plate. Use your test probe or digital multimeter to convince yourself that no power is reaching the appliance. You will find two color-coded wires, one black and one white, as well as a ground wire. Disconnect all of these. 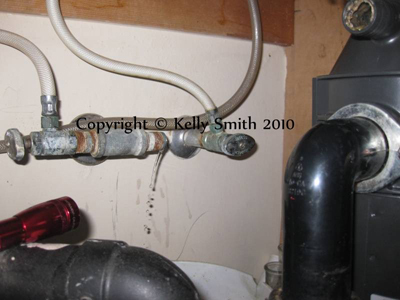 A water supply line is connected to a shut-off valve under the kitchen sink. Close the valve and remove the supply line with a pair of slip-joint pliers. Have a bucket and towel handy to catch residual water. Disconnect the supply line at the dishwasher. Now disconnect your appliance drain line. It should be at the garbage disposal (if you have one), or the sink drain line. 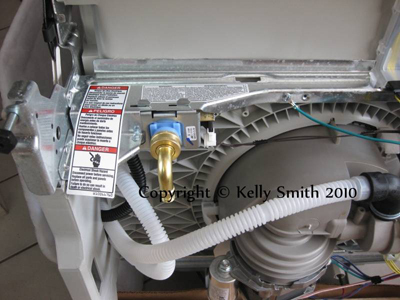 There should be a couple of screws securing your washer to the underside of your countertop. Remove the screws. Carefully slide the old unit out taking care not to scratch your floor. As you might imagine, installation is just reversing the removal steps with a few set-up tasks thrown in. For example, the new washer will need to be leveled. The actual details on this procedure will be included with the washer. Its usually done by turning a pair of adjustment screws at the base. I had to buy a dishwasher installation kit (one return trip to Home Depot). The kit includes a braided supply line with 3/8 fittings and a 90° elbow that attaches to the appliance. Use Teflon tape to connect metal fittings. I did find that Murphys law applied. For starts, my old supply line was copper, so the new 3/8 fitting leaked. If you run into this situation, you will need to turn off the main water supply to your home. Then you will need to replace the old cut-off valve with a new one (another trip to Home Depot. It turns out to be a cheap fix but requires more work.